Even though the platform load cell 1006 has a compact design it still reliably provides high resolution, accurate results. The 1006 can be easily mounted using the two vertical through holes at then either end of the load cell. By corner adjusting each individual load cell, the position of load on the platform does not give rise to any errors. Platform sizes up to 200 mm x 200 mm are permitted. As well as the standard applications in postal, kitchen, and counting scales, the 1006 load cell can also be used in filling applications, such as tea and coffee (beverage) machines, level control of small tanks and hoppers, and the manufacture of intravenous drips and dialysis equipment. For larger platform scales, four or more load cells an be connected together mechanically & electrically to produce an low profile scale. 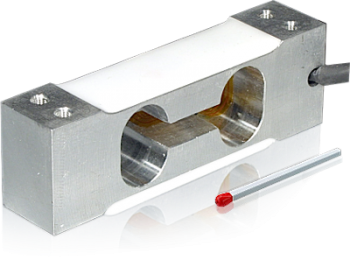 In industrial applications, the 1006 load cell can often be used as a force transducer. Typical applications include the measurement of thread tension in textile weaving machines and reel tension measurements in the foil and paper manufacturing industries. Other applications include the measurement of forces and torques in medical rehabilitation and training equipment which allows the monitoring and tailoring of exercise routines to suit the needs of individual patients.